An archive, in reverse chronological order, of essays, interviews, and talks relating to open source software. Tim appeared at SxSW 2019, speaking on a panel with Jessica Rosenworcel, commissioner of the US Federal Communications Commission, and US congressman Mark Takano (Democrat, California). Moderator Zach Graves, head of policy at the Lincoln Network, led the discussion on how important it is for elected members of government to have a better understanding of emerging technologies, issues related to data and privacy, and our increasingly digital future. Tim O’Reilly on what’s gone wrong with Facebook — PBS’s Amanpour & Co., November 2018. As a bombshell New York Times report questions Facebook’s ability to police itself, Tim O’Reilly, the man who coined the phrase ‘Web 2.0’ explains what’s gone wrong and how tech can fix it. Watch the interview, conducted by Walter Isaacson, here. Evolution of the Digital Economy — BGG Henderson Institute and the Institute for New Economic Thinking, September 2018. Our guest speakers explored the evolution of technology and its implications for corporate strategy, the economy and relations with government and society. Tim, founder and CEO of O’Reilly Media and renowned technology commentator, talked about the need to update our mental models in thinking about technology being every bit urgent as updating our business models. Drawing on his book WTF? What’s the Future and Why It’s Up to Us, Tim explained, for example, how technology has shifted the boundaries of recognized economic activity, bringing personal data and household activities into the equation. Read the summary of this event or watch the video here. Evolving the New Economy: Tim O’Reilly and David Sloan Wilson Evolutionary theory meets artificial intelligence and the management of algorithms — Evonomics, August 2018. WTF is the Future of Tech? An Interview with Tim O’Reilly — Lean Startup Co, August 2018. Data, Analytics, and What’s The Future — Future of Data podcast, August 2018. The story I’ll tell is one that may be of interest to people who have been sold the Silicon Valley story that innovation begins with entrepreneurs meeting up with venture capitalist who will fund their businesses. I started my business with $500, and it was funded not by VCs but by customers. While we talk a lot in Silicon Valley about product-market fit, it’s still a bit of a bad message that’s being spread to entrepreneurs, which is that you need investors in order to start a business… There are a lot of companies that get started with investors and never find customers. Whereas if you find a customer, you have a business from day one. “Oracle of Silicon Valley” Tim O’Reilly on WTF: Do Work That Matters — Singularity.FM, July 2018. Every Great Innovator is a Designer: Six Insights from Our Conversation with Tim O’Reilly — Salesforce blog, June 2018. What’s the Future? The “Oracle of Silicon Valley” shares his contrarian thoughts about technology, capitalism, and preparing for the big shifts on the horizon. — The Art of Manufacturing podcast, June 2018. I was curious, given Tim’s superpowers in identifying trends, where he thinks technology is going today and how it will impact the future of work and business. We talk about his thoughts on the role of capitalism and Silicon Valley. He also shares ideas from his book and many others. I ask Tim how to predict the future, and he tells me that’s the wrong question. But, he gives us excellent tips for identifying trends and some really provocative ideas about our role as entrepreneurs in developing a just and abundant world for everyone. He’s a deep thinker, and it’s no surprise he’s been called The Oracle of Silicon Valley. The “Next Economy”—What Could It Look Like? How Can Leaders Bend Transformative Forces Towards Equity? — Keynote address, New Profit’s Gathering of Leaders, May 2018. Tim O’Reilly’s book list for the Manual for Civilization — The Long Now Foundation, April 2018. If you were charged with reviving civilization from the ground up, what books would you want at hand? That’s the question the Long Now Foundation asks as it builds a crowd-curated living library of 3,500 books housed at The Interval, the organization’s San Francisco café. The collection began with books selected by two Long Now founding members—Stewart Brand and Brian Eno—and includes picks from special guest curators, including Tim O’Reilly. Interview with Tim O’Reilly — The Tonya Hall Show, April 2018. Tim spoke with podcast pioneer Tonya Hall about the big tech giants, the impact of AI on the economy, business leaders as activists, and becoming a mulitplanetary species. Tim O’Reilly discusses his latest book, What’s the Future and Why It’s Up to Us — Digital HKS, April 2018. In an informal talk at the Harvard Kennedy Business School, Tim offers reasons to be optimistic about the future even in the face of uncertainty about rapidly advancing automation and monopolistic tech companies, especially if we use our newfound cognitive skills to build better markets, rewrite the algorithms that control the financial markets, and get on with the real work of the 21st century. Tim O’Reilly: ‘WTF’ does not stand for ‘What the future.’ A conversation with the founder of O’Reilly Media on how we can take back control of our technology and our lives. — PC magazine, March 2018. During SXSW, Tim spoke with Dan Costa, PC magazine editor in chief, SVP for content at Ziff-Davis, and host of the Fast Forward podcast. The two tech veterans discussed the genesis of Tim’s book, the reasons Tim remains optimistic about human progress, the problems of wage stagnation and income inequality, the importance of improving marketplace algorithms, the folly of pursuing shareholder value and neglecting the welfare of employees, and more. Watch the interview and read a quick summary here. Tim O’Reilly to tech companies: Use AI to do more than cut costs — VentureBeat’s BLUEPRINT forum, March 2018. O’Reilly thinks that the way tech companies currently think about automation is problematic. They focus on using AI to reduce costs—which often translates to eliminating jobs. Instead, tech companies need to think about using AI to make those jobs better. Getting companies to think about using AI to do more than improve their bottom line isn’t just the responsibility of individual companies—it will require an overhaul of the current economic system, said O’Reilly. Watch the presentation and read a brief summary here. TWTF with Tim O’Reilly, live from SXSW — Using the Whole Whale podcast, March 2018. In a special (perhaps Very Special?) episode of Using the Whole Whale recorded live in Austin, Olivia Marlowe-Giovetti speaks with Tim O’Reilly of O’Reilly Media. If you’re using the Internet today (and you are if you’re listening to this podcast), you can thank Tim in at least some small part. He wrote the first popular book on the Internet in 1992. His site Global Network Navigator launched as the first web portal in 1993 (and sold to AOL in 1995). He’s been behind terms like “open source software,” “Web 2.0,” and is now looking at how AI and the on-demand economy are transforming the nature of work and the future shape of businesses. Tim O’Reilly on Managing in the Age of Algorithms — Interview with Massimo Portincaso of BCG, February 2018. Watch the interview or read the highlights here. Tim O’Reilly eyes the future of the tech industry by peering into the past — Fast Company, February 2018. Read the story and listen to the Bottom Line podcast here. Tim O’Reilly: “It’s our brains that are being hacked” — Danny in the Valley, January 2018. Review—WTF Is Wrong With Capitalism? — Shift Forum Reads, January 2018. Read the full review by John Battelle here. Can we learn how to predict the future? Mapmaking in the 21st century — Hidden Forces podcast, January 2018. The process of exploration is one of mapmaking. Maps are not some relics of a bygone era. Maps are not artifacts that exist naturally in the world. Maps are products of the human mind. Mapmaking is the process through which our brains structure time and space; they help us put order around experience. Maps are the expression of human perception. If we want to navigate the world better, and if we want to learn how to predict the future, then we need to build better maps. Tim O’Reilly helps us do just that. Listen to the interview by Demitri Kokinas here. An optimist's guide to a future run by machines — Quartz, December 2017. In his new book WTF? What’s the Future and Why It’s Up to Us, published by Penguin Random House in October, the tech thinker and writer envisions a future in which people, particularly tech and financial executives, make smart, conscientious decisions to harness technology for good…. With the right choices, machines doesn’t have to put humans out of jobs. Rather, they could create work—and joy—for us. O’Reilly is keen to stress this ideal future, where AI brings us unimaginable delights and higher standards of livings, can only be achieved if we radically change how we view our economy and capitalist system. Tim O'Reilly says technology too profit-focused — KQED Forum, December 2017. Longtime tech insider Tim O’Reilly calls his new book an economic call to action wrapped in a business book wrapped in a memoir. Titled WTF? What’s the Future and Why It’s Up to Us, the book argues that technological innovation can only drive positive economic and social change if the public demands prosperity for all. Brian Rose interviews Tim O’Reilly — London Real, December 2017. This far-reaching discussion includes what we can learn from watching the peripheral alpha geeks, envisioning the world of tomorrow by observing today’s seemingly small indicators, the role of government in technological breakthroughs, business ethics, secrets, and lessons learned from going through the dot-com crash, the importance of generosity, and reflections on iconic tech industry leaders. Predicting the future with Silicon Valley "oracle" Tim O'Reilly: The tech veteran has been ahead of the curve for 30 years. Here's how he does it — Management Today, December 2017. The traditional narrative now is that innovation is all entrepreneurs and VCs—that really misses the point. Innovation often comes in markets that people don't expect, starting with people who are enthusiasts. I always pay attention to those kinds of people. Of the great entrepreneurs I know, there are some who were seriously intent on becoming entrepreneurs—Bill Gates, Steve Jobs, Jeff Bezos. But Larry [Page] and Sergiy [Brin] were just trying to do something interesting. We under-rate the accidental entrepreneur, who makes something happen because they love what they do and think there's a problem worth solving. Google's greatest achievements were when they were motivated by access to all of the world's information. Tim O'Reilly on What's The Future (WTF?) — Future2 podcast, December 2017. Review—Tim O'Reilly's WTF? A book that tells us how to keep the technology baby and throw out the Big Tech bathwater — Boing Boing, December 2017. WTF? is a book about technology as it was, as it is, and as it could be. It is told from the perspective of someone who has been personally present at the most important moments in the fast-paced history of tech, and who played a significant role in those moments. It's a rare and important piece of criticism that inspires even as it dissects. Please do read this book. Read the full review by Cory Doctorow here. Can a society ruled by complex computer algorithms let new ideas in? — Jim Daly's analysis of Tim O'Reilly's appearance Reinvent's What's Now: San Francisco, November 2017. O'Reilly asks a simple question, not just about the platform economy, but about any new or powerful technology: "Will it help us build the kind of society we want to live in?" Read the commentary and watch the accompanying video clips here. A video of the complete Reinvent discussion is available here. Tim O'Reilly—The Trend Spotter — The Tim Ferriss Show, November 2017. Money is like gas during a road trip. You don't want to run out of gas on your trip, but you're not doing a tour of gas stations. Robot workers will improve everyone's lives, not just the rich, according to Tim O'Reilly — Business Insider, November 2017. What do rich people do today? First off, they have great education with small class sizes, intensive teaching, they have concierge medicine. They have incredible opportunity to enjoy the fruits of the good life. Why wouldn't we want that for everybody? If we had the machines doing more of the work we could all live like rich people and that I think is kind of the vision. Review—Books by the Bay — Mercury News, November 2017. As the founder of O'Reilly Media, Inc., Tim O'Reilly takes a wide-angle view of the industry. His latest book, a readable mix of memoir, industry analysis and strategy guide, considers the ways new technologies are changing the nature of business, education, government and the economy. Things that once made us say "WTF?," he opines, now are "well on their way to being the stuff of daily life." His outlook is pretty upbeat, even as he envisions a world ruled by machines hostile to humanity. Read the full review by Georgia Rowie here. People power, not robots, will overcome humanity's challenges — Financial Times, October 2017. We are in the thrall of an economic theory that says that wages and working conditions are entirely subject to inevitable laws of supply and demand, not recognising the rules and incentives we have created that ruthlessly allocate the benefit of increased productivity to the owners of capital and to consumers in the form of lower prices, but dictate that human workers are a cost to be eliminated. Judged by the hollowing out of modern economies, there is something wrong with that theory. Read the article and listen to the audio clip here. Tim O'Reilly says the economy is running on the wrong algorithm — Wired, October 2017. We've got the economy running on the wrong algorithm. That's according to Tim O'Reilly, founder of O'Reilly Media and Silicon Valley's favourite futurist, who argues that optimisation for corporate profits above all else—and often at the cost of jobs—is becoming untenable. "We've forgotten that if we don't pay people, they can't buy our products; they can't respond to our ads," he says. "So there's a problem with the algorithm that we're using to run modern businesses." Tim O'Reilly: 'Generosity is the thing that is at the beginning of prosperity' — Interview in The Guardian, October 2017. Tim O'Reilly believes we need to have a reset. This means more coming from him than it does from most people. The 63-year-old CEO, born in Ireland and raised in San Francisco, is one of the most influential pioneers and thinkers of the internet age. His publishing company, O'Reilly Media, began producing computer manuals in the late 1970s and he has been early to spot many influential tech trends ever since: open-source software, web 2.0, wifi, the maker movement and big data among them. His new book, WTF: What's the Future and Why It's Up to Us, looks at work and how jobs will change in a world shaped by technology. It is sometimes hard not to be pessimistic about what's coming over the hill, but he is convinced that our destiny remains in human hands. If Facebook makes you mad, it could be what you're clicking — CNN Tech, October 2017. 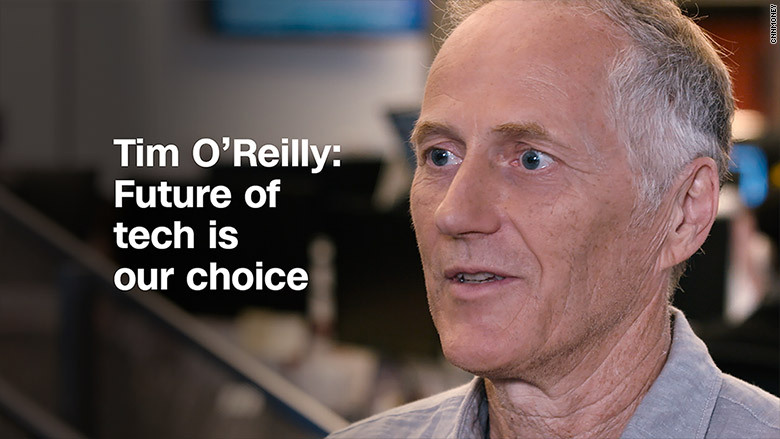 Tech entrepreneur Tim O'Reilly tells CNN Tech's Laurie Segall why we're responsible for letting machines replace people in the workforce and how we have the power to fix it. Re-evaluating the economics of tech — Marketplace, October 2017. I could see coming years ago that people were increasingly afraid of technology. And optimism about the future has been a huge, driving positive force in the economy. And once we become afraid of technology, we become afraid of progress. Bad things happen. And I feel that the tech industry deserves some of the blame for that. Because all we've been talking about is disruption—what we're going to destroy. And the kinds of values that are often espoused by the tech industry really are an anathema to the main street economy in which many people live. Listen to the complete interview by Marketplace Tech's Molly Wood. Tech entrepreneur asks "WTF? What's the future?" — The Next Revolution with Steve Hilton, October 2017. I'm really sick and tired of hearing that the robots are going to take our jobs. They're only going to do that if that's what we tell them to do. And a lot of what we have to think about is: how are we telling them that? Why are we telling them that? And what do we do about it? "WTF?" author Tim O'Reilly says tech and business elites are setting the world up for "war and revolution" — Recode Decode podcast with Kara Swisher, October 2017. O'Reilly fears that today's prevailing philosophy of elevating profit above all other goals is setting the entire economy down a dangerous path. When Wall Street's priorities come before society's, he said, the financial markets become a "rogue AI," making choices that are ultimately bad for us. Tim O'Reilly on why the future probably won't be all that terrible: Economies as AI, humans as gut bacteria for tech, and how the Luddites got it wrong — Ars Technica, October 2017. Tim foresees smooth sailing if society can better provide for those being left behind. In this, he cites the bogeymen of all tech optimists, the Luddites. But he suffuses his discussion of them with both empathy and optimism. Not the blind optimism of the naïve. Not the self-serving optimism of the wealthy libertarian. But the fact-based optimism of a thoughtful technologist who is, at bottom, a realist. Read Rob Reid's article here. Listen to Rob's After On podcast to to hear his complete interview with Tim. Algorithms have already gone rogue — Wired interview by Steven Levy, October 2017. If you think about the internet as weaving all of us together, transmitting ideas, in some sense an AI might be the equivalent of a multicellular being, and we're its microbiome, as opposed to the idea that an AI will be like the golem or the Frankenstein [monster]. If that's the case, the systems we are building today, like Google and Facebook and financial markets, are really more important than the fake ethics of worrying about some far future AI. We tend to be afraid of new technology, and we tend to demonize it, but to me, you have to use it as an opportunity for introspection. Our fears ultimately should be of ourselves and other people. Tim O'Reilly's Vision of the Future — BBC World Service podcast Click, October 2017. Mapping the future with Tim O'Reilly — Interview on the Soonish podcast, October 2017. When Tim O'Reilly talks, Silicon Valley listens. In this special episode, O'Reilly tells us about his new book WTF, which argues that the technology industry has become tone-deaf—and that the only way to avoid mass technological unemployment and achieve shared prosperity is to rethink the algorithms that govern our whole economy. Harry Potter. Tim O'Reilly. Tove Jansson — BBC Radio 3's Free Thinking, interview with Anne McElvoy, October 2017. I think that our financial markets are also one of these kind of AIs that we're living within; an algorithmic system that tells companies what to do. And 30, 40 years ago we started telling companies "Optimize for share price above all else. Treat people as a cost to be eliminated." That sounds a lot like the most dystopian versions of AI. "Get rid of people." Breaking up tech: Regulators increasingly are challenging Facebook, Amazon, and Google on how they're managing their dominant market positions — Barron's cover story, October 2017. If these giants get sideswiped, it could be because of the fatal flaw in large tech companies that's often drawn social ire and regulation—the will to exploit their dominance. "The biggest thing they're vulnerable to is that they work too hard to protect their existing businesses," says O'Reilly. "That's always where companies get it wrong—Microsoft got it wrong, IBM before them got it wrong—they basically did things to extract money from customers rather than benefit customers," he says. How the current tech titans meet this challenge likely will determine how shareholders fare as well. a16z Podcast: Platforming the future — From Andreessen Horowitz, October 2017. In this hallway-style podcast conversation, O’Reilly Media founder Tim O’Reilly and a16z partner Benedict Evans discuss how we make sense of the most recent wave of new technologies—technologies that are perhaps more transformative than any we’ve seen before—and how we think about the capabilities they might have that we haven’t yet even considered&hgellip; We are also in the midst of so much foundational change happening so fast, that we as a society have some very large questions—and answers—to consider. Tim O'Reilly on the future of technology — Video interview with James Maguire of Datamation on the Emerging Tech podcast, October 2017. The kinds of jobs that we have to understand may be part of our future may require different kinds of skills. When you think about AI routinizing being an analyst at a ban…or some of the clerical stuff, that's machine work. But think about being a good teacher. Think about being a good caregiver. These are things that we actually don't value very highly, and maybe we should be valuing them more highly. Reality is an activity of the most august imagination: A conversation with Tim O'Reilly — Edge, October 2017. You can see how poetry, history, technology, and science are all telling us the same thing: "Make it new!" Watch the full interview here. The secret of happiness and living a good life: "Make tea. Empty dishwasher. Hang laundry." — Thrive Global, October 2017. Read Tim's responses to the Thrive Questionnaire, an ongoing series that provides an intimate look inside the lives of some of the world's most successful people. The new world of work: A forum at the Churchill Club — Interviewed by Elizabeth Dwoskin, Silicon Valley Correspondent at the Washington Post, September 2017. We are seeing an economy increasingly dominated by giant platforms, and we have to start thinking about how do those platforms invigorate and enrich our society rather than just enrich their creators. The Future and Why We Should "Work on Stuff that Matters" — Interview by Gretchen Rubin, October 2017. "Investors" are not really investors. They are bettors in the financial market casino, while the world's great problems—and the people who could be solving them—are no longer seen as the proper focus for investment. We have told our companies to optimize for "the bottom line," while treating people as a cost to be eliminated. It doesn't have to be that way. We can build an economy that treats people as an asset to invest in. Review—Haven't You Read Tim O'Reilly? — The Family, October 2017. I've just finished reading Tim O'Reilly's WTF? What's the Future and Why It's Up to Us. In the current anti-tech atmosphere, some may deride the publication as a self-serving effort by a Silicon Valley guru. My view is precisely the opposite: this is a book that is both insightful and unprecedented in its scope, ambition, and potential impact. Read the full review by Nicolas Colin here. Review—Tim O'Reilly on why the future probably won't be all that terrible — Ars Technica, October 2017. Tim's book is a feast. Part memoir and part forward-leaning manifesto, it's full of contrarian insights and fresh lenses for framing tech's ever-baffling trajectory. All is backed up with data, facts, and first-hand reports from Tim's decades on the front lines. And it's steeped in a level-headed positivity that elegantly rebuts the sudden knee-jerk pessimism of a community that (let's face it) has it pretty good, compared to most humans across history. Read the full review by Rob Reid here. Review—WTF? Programming the master algorithm for the future we want — ImpactAlpha, October 2017. This time the entrepreneur and tech seer's dispatches go beyond Silicon Valley, beyond technology and even beyond the good jobs and shared economy agenda O'Reilly has championed in his WTF conferences over the last few years. O'Reilly takes on the current logic of capital markets themselves… O'Reilly's diagnosis is intriguing enough, but the real contribution of the book is in his outlines of an alternative. Drawing on tech history over the last few decades, he sketches a logic that could conceivably save "the market" from itself. Read the full review by David Bank here. Review—WTF? A New, Better, Warm-Blooded Capitalism—Linking Profit to Human Values — FairPay Zone, October 2017. Read the full review by Richard Reisman here. Review—WTF? What's the Future and Why It's Up to Us — CTOvision, October 2017. WTF? What's the Future and Why It's Up to Us is a fantastic guide and overview of the tech and business megatrends sweeping over society… This book gets our strongest possible endorsement for anyone who wants to play a role in shaping the future of our tech enabled world (and that should be all of us). Read the full review by Bob Gourley here. No. The CEO must be the chief ethics officer! Facebook Live video capture from Airbnb headquarters — September 2017). The second episode of Airbnb's Book Series, beamed out to Airbnb hosts around the world, featured a discussion of relevant themes from WTF? If in fact the future belongs to networked platforms, they actually have to become a source of employment; they have to become a source of income. It doesn't have to be the traditional job, but we do have to build this great circulatory system in which people get paid and create things that other people want, and that is the heart of what we call an economy. Tech innovator Tim O'Reilly: Don't fear technology, robots or the future — The Press Democrat, September 2017. Right now I'm optimistic about the subject of jobs. What I'm not optimistic about are the moral values of business. You realize that our financial markets also are in an algorithmic system with an objective function, which is to maximize shareholder value. We actually just created our own rogue AI. The reason it is the most important one is because Google and Facebook and all the other AIs are answerable to it. That's why in some sense the financial markets are the master AI. Tim O'Reilly thinks focusing less on shareholders might just save the world — TechCrunch, September 2017. Tim O'Reilly, founder and CEO of O'Reilly Media and author of a new book, WTF: What's the Future and Why It's Up to Us, thinks a lot of (Silicon Valley's) problems could be solved if only big tech would focus a little less on profits and more on enabling other companies to be built atop of, or in partnership, with their platforms. In fact, his book, which is part memoir and part case study, is largely an entreaty to do things differently before it's too late." The Future of Economic Leadership — July 2017). The World Affairs Council produced a short video of my thoughts on the lessons of the US government's post-WWII spending program, which fueled an unprecedented period of economic growth and prosperity across the country. While the challenges we face today are enormous—climate change, crumbling infrastructure, and a growing wealth gap among them—bold government leadership can provide solutions that will make the nation stronger. "The leadership we need is not 'Let's somehow encourage the market through some magic fairy dust to produce jobs.' It's to exert leadership about what needs doing!" The saddest thing about Uber is that it isn't an exception. It is what we get when we tell companies that creating shareholder value is the primary goal of an organization. Creating real value for customers, workers, and society becomes secondary to creating value for investors. Live from the Aspen Ideas Festival — June 29, 2017. I talked with NY Times bestselling author Charles Duhigg about my forthcoming book in a Facebook Live broadcast from the Aspen Ideas Festival. We talked about some of the key messages in my book, but also reflect on some of the ideas in Charles' book The Power of Habit and how they relate to anxiety about AI and the rise of Trump. Do More: What Amazon Teaches Us About AI and the "Jobless Future" I reflect on the fact that Amazon added hundreds of thousands of warehouse workers at the same time as they added 45,000 warehouse robots. Rather than simply pursuing efficiency, Amazon has upped the ante, improving their speed of delivery (which is now same-day for many products in some locations) and continuing to drive what Jeff calls "the flywheel" of Amazon's success. Amazon reminds us again and again that it isn't technology that eliminates jobs, it is the short-sighted business decisions that use technology simply to cut costs and fatten corporate profits. This is the master design pattern for applying technology: Do more. Do things that were previously unimaginable. But the biggest thing that we're doing is we're not focusing anymore on work. What I mean by work is things that need doing in our society. Because companies are no longer incented to invest in the real economy. Why would you invest in training your workers? Why would you invest in a new speculative product if you can actually improve your stock price which is the measure of your success by simply buying back the stock? We've ended up with an economy where people are buying and selling these financial assets rather than taking those profits and putting it in the real economy. If you look at a company like Amazon or Tesla what's so interesting is they're using the financial markets the way they're supposed to be used, which is they're basically saying, "We're doing this really amazing thing, trust us." And invest in the real economy and they actually are creating jobs and they're transforming their various segments of the economy sometimes in ways that are disruptive and challenging but at least they're investing in making something, doing something. Again I think the biggest thing we do is change the incentives for financial engineering. Hey Silicon Valley: President Obama has a to-do list for you — Wired, November 2016. The best way for the tech industry to tackle inequality is for it to do what it's supposed to do: innovate in ways that create actual gains in growth and productivity—that don't just replace people but empower them to do what was previously impossible." My talk at the White House Frontiers Conference —October 2016. I opened for President Obama at the White House Frontiers Conference in Pittsburgh, talking about the lessons of the first industrial revolution for the AI driven future. I thought it was pretty cool that the White House comms team approved a talk with the title "WTF?" They gulped, but then said OK. Discussion with McKinsey's James Manyika about The Next Economy. I discuss my ideas about the Next Economy with James Manyika, senior partner at McKinsey & Company and director of the McKinsey Global Institute. Part one discusses what I consider the central design pattern of technology: to enable people to do things that were previously impossible, resulting in new kinds of productivity. But I worry that "We have created an extractive economy. We have abandoned the idea that growth is only good if it leads to prosperity for all." In part two, James and I talk about the applications of this design pattern to business. Why we'll never run out of jobs —Excerpt from my talk at the O'Reilly AI Conference, September 26, 2016. The full talk is available on Safari. A deficit of idealism. In July 2016, I spoke with John Battelle about why I believe that is not just the obligation, but also the self-interest of every company, to build a robust society. I also discuss why I called my book "WTF," how to ensure that tech's role in society is as a force for good, how I feel about the B Corp designation, and the magic of unicorns. One of the nice things that John did is provide a transcript along with the video! This is probably one of the best condensed presentations of my key ideas on the subject of tech and the economy. Makers and Takers — I interviewed Rana Foroohar at the World Affairs Council, June 2016. I loved Rana's book, Makers and Takers: The Rise of Finance and the Fall of American Business, and we enjoyed a wide ranging conversation about the role of the financial industry in the rise of inequality in America and around the world. Let's optimize for the long term —An interview with Peter Leyden, founder of the Reinventors Network. "Let's stop optimizing for the short-term. Let's start optimizing for the long-term, and think about how to make the society we want," I said. I acknowledge that technology may be destroying jobs today, but only because we've built incentives into our economy to encourage those choices. Measuring the Economic Impact of the Sharing Economy — March 2012. While at our Strata Conference, I stopped by +John Furrier’s Cube for an interview. We talked about a lot of things, but this is probably the first public airing of some ideas I’ve been thinking a lot about lately, namely how we can best measure the economic impact of what Lisa Gansky calls the sharing economy. I start with a paper I read in the 70s, Steve Baer’s “Clothesline Paradox,” which pointed out that when people hang their clothes on the line rather than putting them in the dryer, that reduction in demand doesn’t go on our energy books as a credit to the renewables column, it just disappears from our accounting.